Our last study book group was so fun and successful that we are putting together another class with a new spin on things by inviting Dr. Holly Hunt to come again and guide us through her book (deeper) on Tuesday evenings, June 10th, 17th, 24th @ 6:00pm. 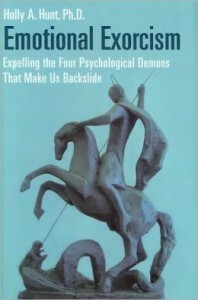 Emotional Exorcism: Expelling the Four Psychological Demons That Make Us Backslide. This class is $35 and includes a copy of Dr. Holly’s book… Emotional Exorcism. This will be a 3 week course studying the 4 psychological demons… We will come together and discuss and figure out how to push each other to dive deeper into becoming more aware. Unlike traditional school, there are no tests, no memorization, and no proving you did the reading. Instead I’m putting together 6-8 people who will share their experiences and figure out how to grow from them. That’s when the real learning happens. The sessions will be located in my office front room beginning on Tuesday June 10th, 2014 @ 6:00pm, lasting about an hour. Sign-up quickly, by responding to this email, because I have only 8 spots left for this extraordinary opportunity! We’re excited about hosting this topic again, and I hope you’ll join us!